Lake Weed Control – Green & Guaranteed! Owning and maintaining a dock can be a lot of hard work. In order to prevent sinking some people will try a floating dock, but those cause a serious decrease in stability and an increase in people unwillingly going for a swim! 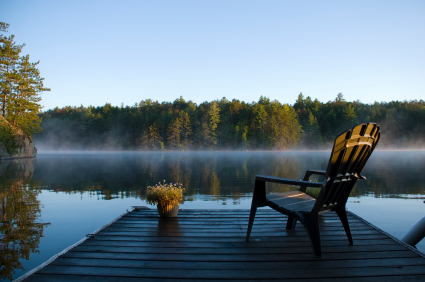 In many cases it’s very difficult to sink dock posts into your lake because the solid bottom is too far down, if it’s solid at all. Over time, some posts will sink and you have yourself a wavy, unsafe dock. Some people use footplates with cement block, but even those require replacement once they practically inevitably sink down into the muck. Besides issues with the dock sinking, it’s impossible to walk around it without sinking into the muck yourself and being attacked by lake weeds. This is where the MuckMat Pro comes in: it prevents your dock from sinking into the muck, allows you to walk around your dock area without sinking, and stops lake weeds from growing. With an average size dock, the MuckMat sticks out about six feet, which gives plenty of space to walk around. MuckMats are extremely effective, durable, and easy to install. If you have been looking for a way to keep your dock from sinking into the muck, a typical lake bottom blanket will not do the trick. Spring is the perfect time to order a MuckMat or any of our other products that will keep your dock up and your lakefront weed free. ©2019 Lakemat All Rights Reserved.